Microsoft has released the first cumulative update (CU) for Windows 10 Spring Creators Update (SCU) version 1803, codenamed Redstone 4 (RS4), to Windows Insiders on the Fast, Slow and Release Preview rings, ahead of its general availability which could be anytime. 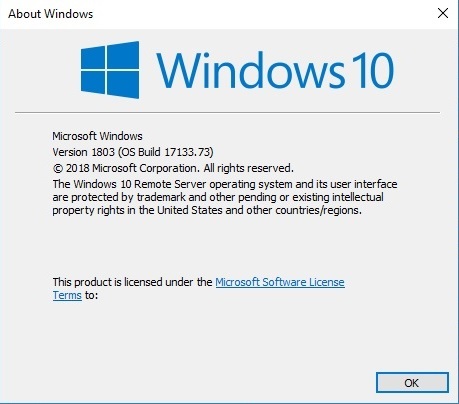 The cumulative update KB4100375 will increase the build version of Windows 10 version 1803 to 17133.73 (10.0.17133.73). While the changelog is short, the cumulative update is expected to bring many bug fixes that are not listed. Microsoft is rumored to originally schedule to release Windows 10 Spring Creators Update on April 10th, 2018, but the release date has been delayed, probably due to show-stopper bugs. To get the latest cumulative update for Windows 10 v.1803, Windows Insiders can check for updates in Windows Update. The hotfix is named as Cumulative Update for Windows 10 Version Next (10.0.17133.73) in the Windows Update of Windows 10 Spring Creators Update v.1803. If you’re not a Windows Insider, or the PC does not join the Windows Insider program as you’re installing using ISO image or Media Creation Tool, you can manually download the cumulative update’s CAB cabinet file, and then install it. Replace C:\Downloads\KB4100375.cab with actual path and file name for KB4100375 CU that you downloaded. Restart the computer for the changes to take effect.